Growing in Grace Podcast: 555. 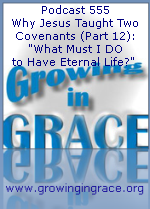 Why Jesus Taught Two Covenants (Part 12): "What Must I DO to Have Eternal Life?" 555. 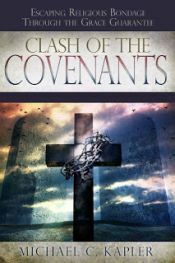 Why Jesus Taught Two Covenants (Part 12): "What Must I DO to Have Eternal Life?" This week we provide a perspective on the story of The Rich Young Ruler. He asked Jesus what he needed to do to have eternal life. Interestingly, Jesus did not say what we Christians might have expected — He did not say, "believe in me." He answered the law-based question with a law-based answer by telling the young man to obey the commandments from the Mosaic law. Why? Jesus was trying to show him the impossible standard of perfection the law demanded without any provision to be able to accomplish it. Have you ever walked out of church feeling worse than when you went in? It was probably for the same reason as the young ruler... The good news was missing. Now if Christ is preached that He has been raised from the dead, how do some among you say that there is no resurrection of the dead? But if there is no resurrection of the dead, then Christ is not risen. And if Christ is not risen, then our preaching is empty and your faith is also empty. Yes, and we are found false witnesses of God, because we have testified of God that He raised up Christ, whom He did not raise up — if in fact the dead do not rise. For if the dead do not rise, then Christ is not risen. And if Christ is not risen, your faith is futile; you are still in your sins! Then also those who have fallen asleep in Christ have perished. If in this life only we have hope in Christ, we are of all men the most pitiable. But now Christ is risen from the dead, and has become the firstfruits of those who have fallen asleep. For since by man came death, by Man also came the resurrection of the dead. For as in Adam all die, even so in Christ all shall be made alive. But each one in his own order: Christ the firstfruits, afterward those who are Christ's at His coming.